I did a lot of handstand practice before the WOD. Practiced day 14, 15 and 16. I did the one armed rows with a 12kg kettlebell (1o reps per arm). For max push ups I did 16 in the first round, then 10 in the 4 following. Managed 3 reps at the first go. Only did a couple of singles after. My arms were quite shot at this point. This one didn’t go so well. I took a long time on the wall climbs as my arms were so tired at this point. I did the deadlifts Rx at 115 lbs and did proper sprints (and a sprint completely gasses me out). So I only managed 2 full rounds + 5 deadlifts in the third round. I started with my handstand challenge. Which was extremely hard! Handstand challenge day 12 was ok. Had to do an overstack to shrug for 15 times ( did 2 sets of 10). I didn’t try very hard though and look at the video I should probably have gone for more range of motion. But I was too eager to start on day 13 to linger on this one too long. Handstand challenge day 13 were hip taps! After doing the shoulder taps I was excited to try this one. When I first started I thought “this is not so bad”, but it very quickly got bad enough that I couldn’t finish the required (40!) reps. On my first set (vid) I almost failed the 9th rep and stopped after that. All the sets after this I failed to get past 4 or 5 reps. In total I did 20 reps and then my arms were toast. After this it was time to do the WOD. The warm up consisted of four 30 second handstand holds, which were really hard after all that work haha. The workout itself was so much arm as well that I really struggled. I did the overhead squats with only 20kg. I just didn’t trust my arms at that point. I only managed to do 3 strict chin ups every round and the handstand push ups I did with one 25 lbs plate and an abmat, but did do them strict. This one was quite nice. I managed to finish all rounds within the allotted minute. I did the goblet squats with a 16kg kettlebell and substituted the toes to bar for knee raises. I can finally do toes to bar now, but it would take me too long and would not be able to do all reps within a minute for this EMOM. On Wednesday I showed up at the box without workout pants! So stupid… So instead I headed home and did some of the handstand challenges. Challenge Day 8 – Posterior Pelvic Tilt. Also knowns as “twerking against the wall” :p. Had to do this for 60 reps. I actually struggled a lot with this one. I tried it before in the last couple of days and never seemed to get much motion happening. Not so good at the booty shaking I’m afraid. Challenge Day 9 – Scapular Elevation. Shrug up and down while in a handstand. Also not so easy. Can really see in the video that I start with big range of motion and it gets less and less with each rep. Had to do this for 30 reps. Challenge Day 10 – Knee Control. I liked this one. Simply had to bend the knees for 30 reps. When I tried this the first time a day earlier in the box I almost fell over on the first few reps, but after those first few reps it was nice and easy. After this I tried to practice some free standing handstands. I failed every time, but did manage to take a nice screencap at the right moment ;). B) The very first time that I did toes to bar in a workout!!!!! I always do knees to elbows as I was never able to really do a toes to bar. I may have touched the bar in a single attempt once or twice, but always with so much effort that I wouldn’t dream of doing it in a workout. But I felt for just going for it. And it went quite ok! I do have to reset between each rep as I don’t have the kip down. But was happy with how it went! I finished the 5th burpee in the round of 6’s. Also worked on the handstand challenge. Which was a hollow body position hold for 60 seconds. 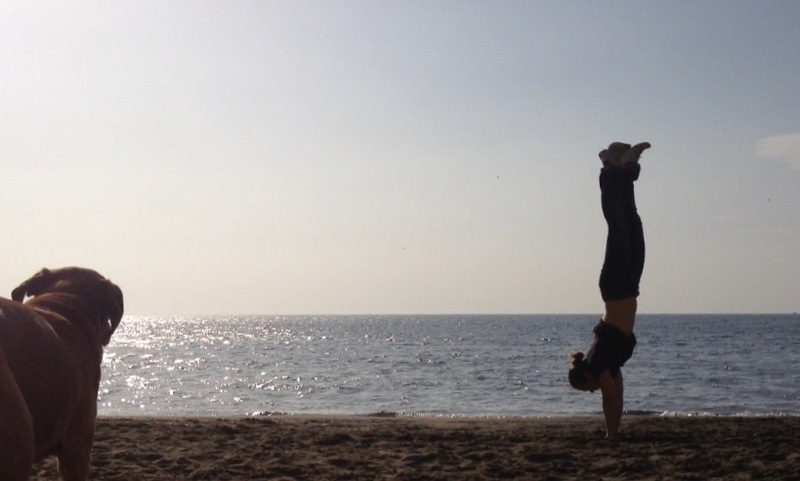 In a handstand. I struggled finding the right position. This was my last attempt and the first one in which I felt that I engaged my core at least a little bit. But felt a bit too easy to be right. When I posted the vid in the challenge someone pointed out that I’m piking too much and gave me some tips. So I will definitely be trying this one again. 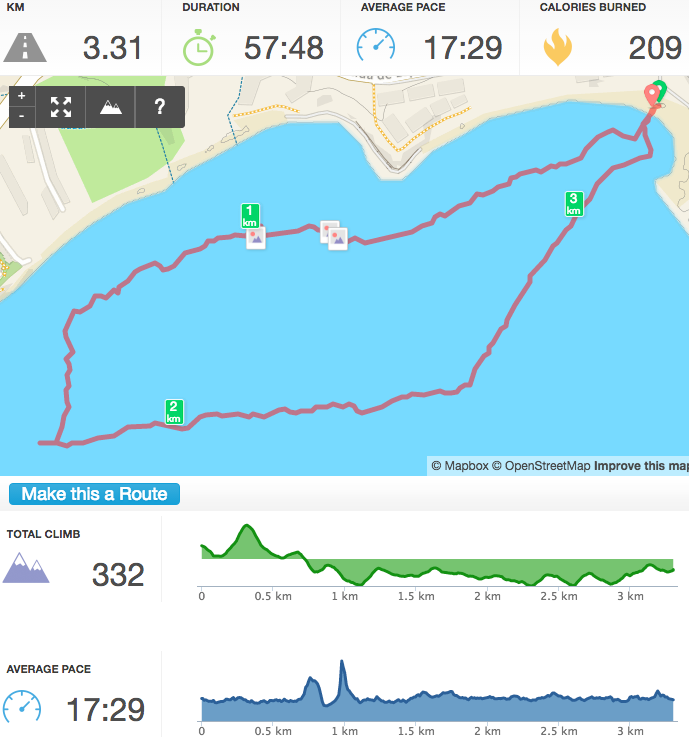 On Sunday I went for a nice short kayak ride. The weather was beautiful and I hadn’t been out kayaking for a long time. At first I thought it might be too cold without a wetsuit, but I was worried about nothing. Went out in shorts and a tshirt and it was perfect! Love being out on sea, with the fishes around me. Had some jellyfish chasing me down as well! I also continued my handstand challenge over the weekend. Day 5 and 6. They are getting more difficult!! Day 6 was quite hard to keep doing it properly after a few reps.. It was my plan to do some of the handstand challenges and then join in with the WOD. But, I messed up my arm during the handstands :(. One exercise (day 3) is turning your hands towards the wall as much as possible, but with your fingers on plates as well, which is quite tough. But what is tougher is getting down after it is done and you’re tired. I lost my balance and my arm snapped the wrong way for a second. Ouchh!!! My hand started having the pins and needles feeling right away and I thought it was best to stop everything. It feels better today though. Yesterday evening the pins and needles disappeared but my pinky started bending a little bit. Felt really tight. But much better today. Hopefully tomorrow all will feel good again. I’m kind of glad work kept me late so that I missed tonight’s WOD. I was tempted to do it, but think is best to give my arm a day rest after yesterday. I should really go for a run though. But feeling too lazy!! Anyway.. these are day 2, day 3 and day 4 of the handstand challenge. Day 2 – Move weight from palm of hands to fingers for 20 reps.
And this is my handstand fail (after day 3 – I did day 4 before day 3). Anita challenged me to do the Gymnasticbodies.com January Handstand Challenge. Where you have to do a challenge every day for 31 days and video it and submit to Gymnasticbodies. Can win some prizes with it, but mainly it’s to improve your handstand :). I did day 1 on Saturday.